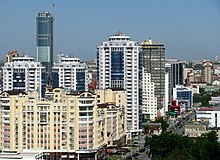 Yekaterinburg (Roushie: Екатеринбу́рг, romanizit as Ekaterinburg an aw) is the fowert-lairgest ceety in Roushie wi a population o 1,398,889 (2012). It is situatit in the middle o the Eurasie continent, on the mairch o Europe an Asie. Yekaterinburg is the admeenistrative centre o Sverdlovsk Oblast an the main industrial an cultural center o the Ural Federal Destrict. Atween 1924 an 1991, the ceety wis namit Sverdlovsk (Свердло́вск) efter the Communist pairty leader Yakov Sverdlov. Internationally Yekaterinburg is best kent as a ceety whaur the last Roushie Tsar Nicholas II an his family wur executit in 1918. It wis foondit in 1723 bi Vasily Tatishchev an Georg Wilhelm de Gennin an namit efter Tsar Peter the Great's wife Catherine I (Yekaterina). The offeecial date o the ceety's foundation is 18 November 1723. It wis grantit toun status in 1796. Suin efter the October Revolution, on 17 Julie 1918, Tsar Nicholas II, his wife Alexandra, an thair childer Grand Duchesses Olga, Tatyana, Maria, Anastasia, an Tsarevich Alexey wur executit bi the Bolsheviks at the Ipatiev Hoose in this ceety. Ither members o the Romanov faimily wur killed at Alapayevsk the day efter. In 1977, the Ipatiev Hoose wis demolished bi order o Boris Yeltsin, tae prevent it frae bein uised as a rallyin location for monarchists. He later became the first Preses o Roushie an representit the fowk at the funeral o the Tsar in 1998. Durin the 1930s, Yekaterinburg wis ane o several places developit bi the Soviet govrenment as a centre o hivy industrie, durin which time the famous Uralmash wis biggit. Then, durin Warld War II, mony state technical institutions an whole factories wur relocatit tae Yekaterinburg awa frae war-affectit auries (maistly Moscow), wi mony o thaim stayin in Yekaterinburg efter the victory. The Hermitage Museum collections wur pairtly evacuatit frae Leningrad tae Yekaterinburg (kent as Sverdlovsk durin Soviet times) in Julie 1941 an remained thare till October 1945 an aw. The lookalike five-story apairtment blocks that remain the day in Kirovsky, Chkalovsky, an ither residential auries o Yekaterinburg sprang up in the 1960s, unner the direction o Khrushchev's govrenment. On 1 Mey 1960, an American U-2 spy plane, pilotit bi Francis Gary Powers while unner the employ o the CIA, wis shot doun ower Sverdlovsk Oblast. He wis captured, put on trial, foond guilty o espionage an sentencit tae seiven years o haurd labour. He servit anerlie aboot a year afore bein exchyngit for Rudolph Abel, a heich-rankin KGB spy, who haed been apprehendit in the Unitit States in 1957. Thare wis an anthrax outbreak in Yekaterinburg in Aprile an Mey 1979, which wis attributit tae a release frae the Sverdlovsk-19 militar facility. Durin the 1991 coup d'état attempt, Sverdlovsk, the hame ceety o Preses Boris Yeltsin, wis selectit bi him as a reserve caipital for the Roushie Federation, in the event that Moscow became too dangerous for the Roushie govrenment. A reserve cabinet heidit bi Oleg Lobov wis sent tae the ceety, whaur Yeltsin enjoyed strang popular support at that time. Shortly efter the failur o the coup an subsequent dissolution o the Soviet Union, the ceety regained its historical name Yekaterinburg. 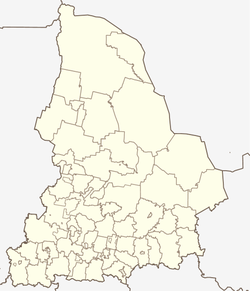 Yekaterinburg is the admeenistrative centre o the oblast. Athin the framewirk o the admeenistrative diveesions, it is, thegither wi twinty-nine landwart localities, incorporatit as the Ceety o Yekaterinburg—an admeenistrative unit wi the status equal tae that o the destricts. As a municipal diveesion, the Ceety o Yekaterinburg is incorporatit as Yekaterinburg Urban Okrug. Yekaterinburg is situatit on the mairch o Europe an Asie, 1,667 kilometers (1,036 mi) east o Moscow, on the eastren side o the Ural Muntains on the Iset River. It is surroondit bi pairtially firthit plains, mainly cultivatit for agricultural purposes, an sma lakes. The ceety featurs a humid continental climate (Dfb) unner the Köppen climate classification. The winter lasts for aboot sax months—frae October till the middle o Apryle—an the temperatur mey faw tae −45 °C (−49 °F), tho rarely lawer than −20 °C (−4 °F) tae −25 °C (−13 °F). Simmer in the Urals is short, wi wairm wather for anerlie 65–70 days an an average temperatur o +18 °C (64 °F). The ceety's location "ahint" the muntain range an heichlie variable winds mean that the wather is quite chyngeable frae ane day tae the next an frae year tae year. Haein decreased durin the 1990s, the population stairtit tae growe slowly in the 21st century. Recently the commercial economy haes impruivit, an business centers lik Yekaterinburg-Ceety hae been planned. Ane o the tawest biggins in the aurie Antey 3 is a skyscraper which is nou complete. Ural Airlines haes its heid office in Yekaterinburg. Yekaterinburg is an important railwey junction on the Trans-Siberie Railwey, wi lines reachin aw pairts o the Ural Muntains an the rest o Roushie. As the economy grew stranger efter the slump o the 1990s, several European airlines stairtit or resumit fleein tae the ceety's Koltsovo Internaitional Airport (SVX). Thir include Turkish Airlines, Lufthansa, Austrian Airlines an Finnair. Yekaterinburg is servit bi the smawer Yekaterinburg Aramil Airport an aw. The ceety's public transit netwirk includes mony tram, bus, trolleybus, Marshrutka routes an Yekaterinburg Metro which opened in 1991. The day, the Yekaterinburg Metro consists o ane line, wi a tot o aicht stations. The Ural Branch o the Roushie Academy o Sciences (UB RAS), as well as numerous scienteefic research institutes an establishments are situatit in Yekaterinburg. Wi its 16 state-awned varsities an educational academies, as well as a nummer o private heicher eddication institutions, Yekaterinburg is considered the leadin educational an scienteefic centre o the Urals. Thir institutions include the Ural Federal University (on base Ural State University an Ural State Technical University), Ural State Pedagogical University, Ural State University o Forestry, Ural State Minin University, Ural State University o Railway Transport, Roushie State Vocational Pedagogics University, Ural State University of Economics, Militar Institute o Airtillery, Ural State Conservatory, Ural State Agricultural Academy, Ural State Law Academy, Ural State Academy o Medicine, Ural State Academy o Performin Airts, Ural Academy o Public Service, Institute o Internaitional Relations, an the Urals Academy o Airchitectur. The ceety haes several dozen libraries, includin the V. G. Belinsky Scienteefic Library, which is the lairgest public leebrar in Sverdlovsk Oblast. Famous for its theatres, Yekaterinburg is hame tae some vera popular theatre companies an aw: the Yekaterinburg Academic Ballet an Opera Company, the Sverdlovsk Academic Theater of Muisical Comedy, the Yekaterinburg Academic Dramatic Theater, the Yekaterinburg Theater for Young Spectators, the Volkhonka (a popular chamber theatre), an the Kolyada Theater (a chamber theatre foondit bi Roushie playwricht, producer an actor Nikolai Kolyada). Yekaterinburg is the centre o New Drama, a muivement o contemporary Roushie playwrichts Nikolai Kolyada, Vasily Sigarev, Konstantin Kostenko, the Presnyakov brithers, an Oleg Bogayev. Yekaterinburg is aften cried the caipital o contemporary dance for a nummer o famous dance companies residin in the ceety: the Kipling, the Provincial Dances, the Tantstrest, an a special depairtment o contemporary dance at the Yekaterinburg University o Humanities. A nummer o popular Roushie rock baunds, sic as Urfin Dzhyus, Chaif, Chicherina, Nautilus Pompilius, Nastya, Trek, Agata Kristi an Smyslovye Gallyutsinatsii, wur oreeginally formit in Yekaterinburg (Ural Rock is aften considered as a pairticular variety o rock muisic. Yekaterinburg an Saunt Petersburg are actually considered tae be the main centres o the genre in Roushie). An aw, some famous opera singers—Boris Shtokolov, Yuri Gulyayev, Vera Bayeva—graduatit frae the Urals State Conservatory. The Ural Philharmonic Orchestra (currently conductit bi Dmitry Liss), foondit bi Mark Paverman an locatit in Yekaterinburg, is vera popular in Roushie an in Europe an aw, as well as the Ural Academic Popular Chorus, a famous fowk-singin an dance ensemble. Thare are ower thirty museums in Yekaterinburg, includin several museums o Ural minerals an jewelery, airt galleries, ane o the lairgest collections onywhaur o Kasli mouldins (a traditional kynd o cast-iron sculptur in the Urals), an the famous Shigirskaya Kladovaya (Шигирская кладовая), or Shigir Collection, which includes the auldest firth sculptur in the warld: the Shigir Idol, foond near Nevyansk an estimatit tae hae been made aboot 9,500 years ago. Anerlie here can you see a collection o Nevyansk icons- in the Nevyansk Icon Museum, wi mair nor 300 icons representin the 18t throu the 20t centuries on display. Vladimir Yelizarov's Recording Studio SVE Records is based in Yekaterinburg. The studio is in a private residence biggit in 1837 unner the teetle "The House of the Misters", in ane o the historical centers o Yekaterinburg ceety, twa hunder metres frae Verkh-Isetsky Lake. In 1987, American sangster Tina Turner recordit twa tracks, which later appeared on her 1989 album Foreign Affair, whilst in the ceety as pairt o her heichlie acclaimit Break Every Rule Warld Tour. Yekaterinburg haes a circus biggin an aw, an ane o the tawest incomplete airchitectural structurs in the warld, the Yekaterinburg TV Tower. Thare are a nummer o unusual monuments an aw: e. g. a popular laundmerk Keybuird monument an a monument tae Michael Jackson. Association fitbaa club FC Ural Sverdlovsk Oblast plays in the Roushie First Diveesion. Futsal club MFK Viz-Sinara Yekaterinburg are the twa-time Roushie champions an the champions o UEFA Futsal Cup in 2008. Weemen's basketbaa club UMMC Ekaterinburg are the current Roushie champions an the champions o EuroLeague Women in 2003. Ice hockey club Avtomobilist Yekaterinburg plays in the Kontinental Hockey League. Bandy club SKA Sverdlovsk  is ane o the clessical teams in which The Keeng of Bandy, Nikolay Durakov  played. Unitit States, Unitit Kinrick, Germany, Fraunce an several ither kintras established thair consulates in Yekaterinburg. The BRIC kintras met for thair first offeecial summit on 16 Juin 2009, in Yekaterinburg, wi Luiz Inácio Lula da Silva, Dmitry Medvedev, Manmohan Singh, an Hu Jintao, the respective leaders o Brazil, Roushie, Indie an Cheenae, aw attendin. The foreign meenisters o the BRIC kintras haed met in Yekaterinburg an aw previously on 16 Mey 2008. ↑ 1.0 1.1 "Eugenie Porunov has been elected the Head of Ekaterinburg – the Chairman of the Ekaterinburg city Duma". Ekburg.ru. Retrieved 2012-04-04. ↑ "President Yeltsin speaks about Tsar Murder". BBC News. 1998-07-17. Retrieved 2012-04-04. ↑ Matthew S. Meselson, et al., "The Sverdlovsk Anthrax Outbreak of 1979", Science 266:5188 (18 November 1994): 1202–1208. ↑ Государственный комитет Российской Федерации по статистике. Комитет Российской Федерации по стандартизации, метрологии и сертификации. №ОК 019-95 1 января 1997 г. «Общероссийский классификатор объектов административно-территориального деления. Код 65 401», в ред. изменения №275/2015 от 1 сентября 2015 г.. (State Statistics Committee o the Roushie Federation. Committee o the Roushie Federation on Staundartisation, Metrology, an Certification. #OK 019-95 Januar 1, 1997 Roushie Clessification o Objects o Admeenistrative Diveesion . Code 65 401, as amended by the Amendment #275/2015 of September 1, 2015. ). ↑ Home page. Ural Airlines. Retrieved on 18 July 2010. "Address: Utrenniy 1g, Yekaterinburg Russia, 620025, SITA SVXTOU6" Russian address: Home page. "Адрес: 620025, Россия, Екатеринбург, пер. Утренний, 1г"
↑ "Monument to Michael Jackson unveiled in Yekaterinburg: Photo gallery". :. 2011-06-29. Retrieved 2012-04-04. ↑ "Official website of the U.S. Consulate General in Yekaterinburg". Retrieved 2012-04-19. ↑ "Official website of the British Consulate General in Yekaterinburg". Retrieved 2012-04-19. ↑ "Official website of the German Consulate General in Yekaterinburg". Retrieved 2012-04-19. ↑ "Official website of the French Consulate General in Yekaterinburg". Retrieved 2012-04-19. ↑ "First summit for emerging giants". BBC News. 16 June 2009. Retrieved 16 June 2009. Wikimedia Commons haes media relatit tae Yekaterinburg. This page wis last eeditit on 9 Juin 2018, at 06:02.